Here is a map of Mosquito Lagoon and the North Indian River Lagoon. Capt. Lemmon runs his Mosquito Lagoon charters and Indian River Lagoon charters within this confines of this aerial map. For your reference, the Cities of New Smyrna Beach, Edgewater and Oak Hill are located in the far upper left corner of this Mosquito Lagoon map and. The City of Titusville would be located in the lower left corner of this Indian River Lagoon map. 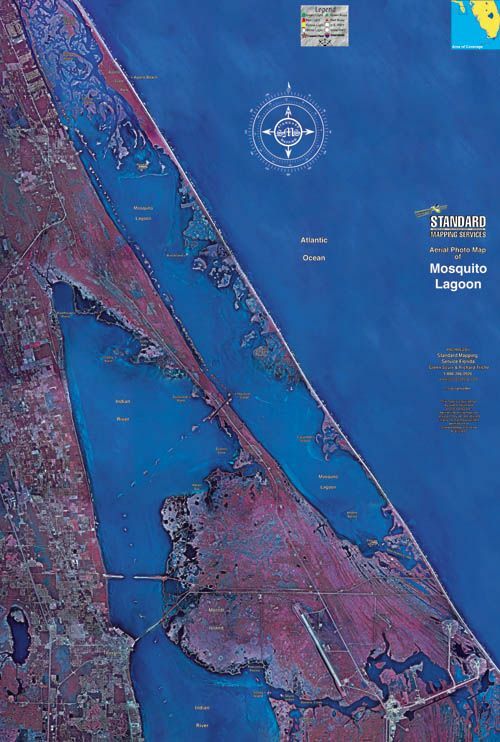 The Kennedy Space Center/NASA shuttle launch pads would be located in the lower right corner of this Mosquito Lagoon map. The long strip of land that separates the inshore waters from the Atlantic Ocean in this map is Canaveral National Seashore. Access into the Park is available in New Smyrna Beach or Titusville. The two large bodies of water in the map looking left of the ocean are the Mosquito Lagoon and the Indian River Lagoon. Mosquito Lagoon fishing charters originate from any one of seven launch locations. Indian River fishing charters originate fromany one of four launch locations.